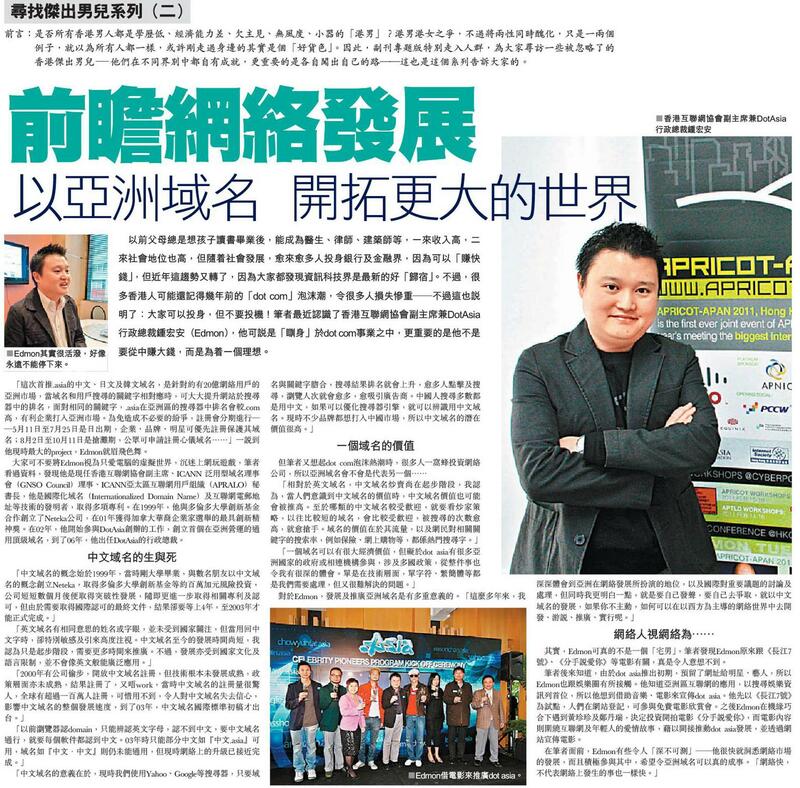 The CEO of DotAsia Organisation, Mr. Edmon Chung met the media in Hong Kong presenting the IDN sunrise policy and the value of the .Asia IDN. 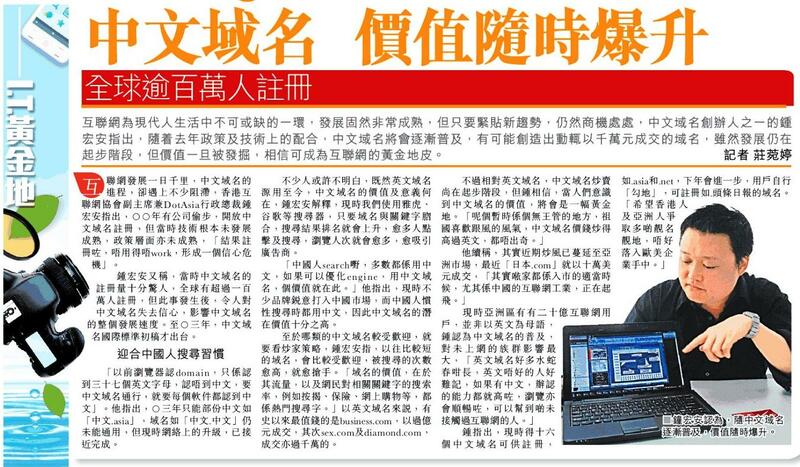 詳情: Presenter: Edmon Chung (CEO, DotAsia Organisation Vice Chair, Internet Society HK Chapter). DotAsia launched Sunrise for Chinese, Japanese and Korean Internationalized Domain Name (IDN) registrations (www.idn.asia...) and announces the opening of the IDN Pioneer Domains Program (www.think.asia).... The Pioneer Domains Program is open for any interested applicant to build out the best domains (e.g. "交易.asia", "ビジネス.asia", "게임.asia", etc. ), while Sunrise provides registered businesses, trademark holders and existing .Asia domain holders priority to protect their brands in the largest and fastest growing Asian Internet marketplace. Application is not on first-come-first-served basis, applicants will not be disadvanced as long as they submit it before the July 20th deadline. 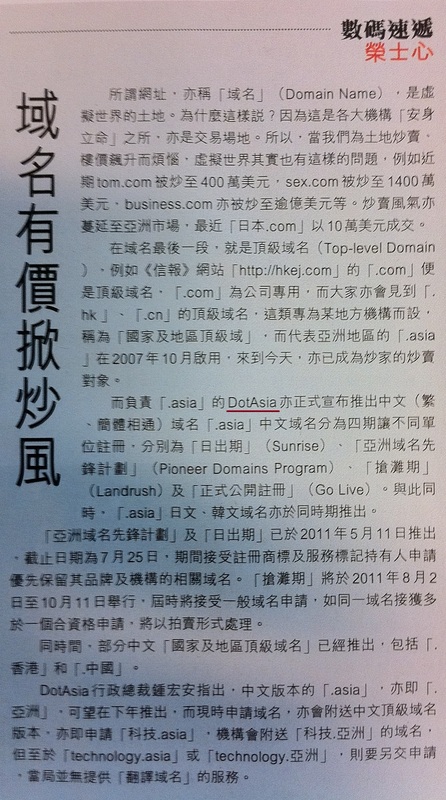 Following the successful .Asia Sunrise and Landrush in 2007, which achieved 100% satisfaction from an online survey, over 40,000 auctions and resulted in 0 disputes, DotAsia implements an enhanced and simplified process for the introduction of Chinese, Japanese and Korean names for the ".Asia" top-level-domain (TLD). Besides trademark and businesses, existing Pinyin, Romaji and Romaja '.Asia' domain holders and IDN ccTLD (country-code TLDs - .CN / .TW / .HK / .SG / .JP / .KR) registrants are also invited to participate in Sunrise. This page contains a single entry by Webmaster published on July 20, 2011 3:33 PM. 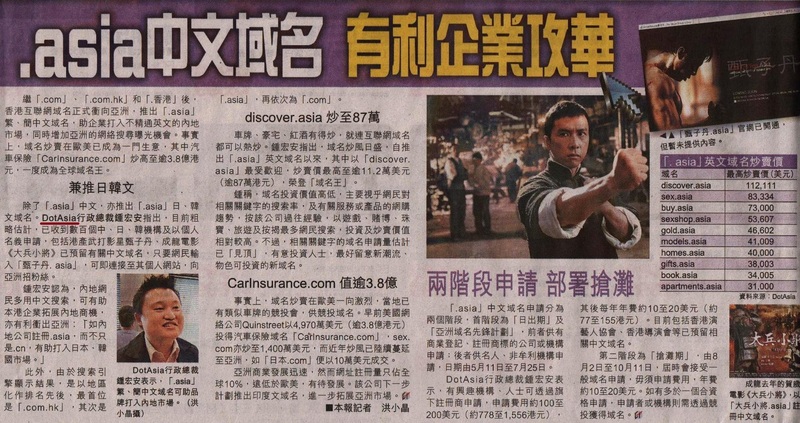 .Asia中文域名的價值 / The Value of .Asia Chinese domain name was the previous entry in this blog. 中文域名生力軍 is the next entry in this blog.